Sealed unit double glazed Georgian style bay window to front, further sealed unit double glazed Georgian style window to rear. Feature brick built fireplace with display/storage ledge to one side. Open plan staircase to first floor with wooden balustrade and built in understair storage cupboard. Two radiators, TV point, power points. One and a half bowl single drainer sink unit with mixer tap and cupboards under. Further matching range of base and eye level units with work surface area and built in electric oven and gas hob with extractor hood over. Space and plumbing for automatic washing machine, space for fridge and freezer. Part tiled and part panelled walls with multi-glazed Georgian style casement doors to rear garden and sealed unit double glazed window to side. Power points, wall mounted gas fired central heating boiler. Quarry tiled floor. 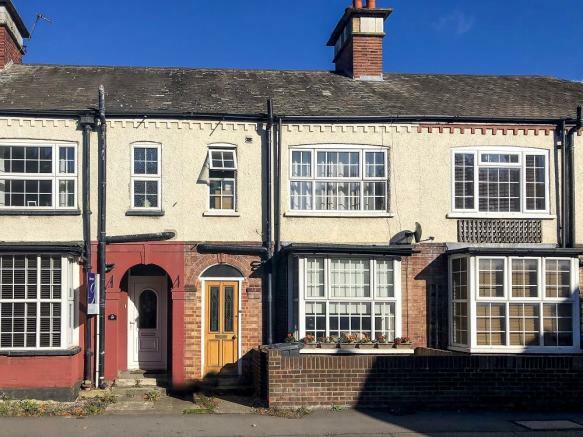 Open plan Staircase to First Floor Landing with built in cupboard housing hot water cylinder, skylight window with access to loft space and panelled doors to all rooms. Sealed unit double glazed Georgian style window to rear. Range of fitted wardrobes with hanging and shelving space and mirror fronted sliding doors. Radiator, power points. Sealed unit double glazed Georgian style window to rear. Radiator, power points. White suite comprising panel enclosed bath with mixer tap and shower attachment, low level WC and pedestal mounted wash hand basin. Part tiled walls with wall light point and radiator. Sealed unit double glazed Georgian style frosted glass window to front. Wooden laminate flooring. Small gravel front garden with low retaining brick wall and pathway to front door. Paved patio area with remainder being laid to lawn with pathway to one side leading to second paved patio and timber storage shed. Pedestrian access to rear. Disclaimer - Property reference FR090. The information displayed about this property comprises a property advertisement. Rightmove.co.uk makes no warranty as to the accuracy or completeness of the advertisement or any linked or associated information, and Rightmove has no control over the content. This property advertisement does not constitute property particulars. The information is provided and maintained by James Ramsey, Chertsey. Please contact the selling agent or developer directly to obtain any information which may be available under the terms of The Energy Performance of Buildings (Certificates and Inspections) (England and Wales) Regulations 2007 or the Home Report if in relation to a residential property in Scotland.